State police say a tractor-trailer hauling cleaning solvent overturned north of Exit 46. The northbound lanes of the Maine Turnpike in Portland were closed for more than four hours Friday morning after a crash involving a tractor-trailer hauling cleaning solvent. The accident forced traffic onto Interstate 295, causing long delays and congestion as far south as Scarborough. The northbound turnpike reopened to traffic around 11 a.m. The truck tipped over north of Exit 46 shortly after 6 a.m., Maine State Police said. 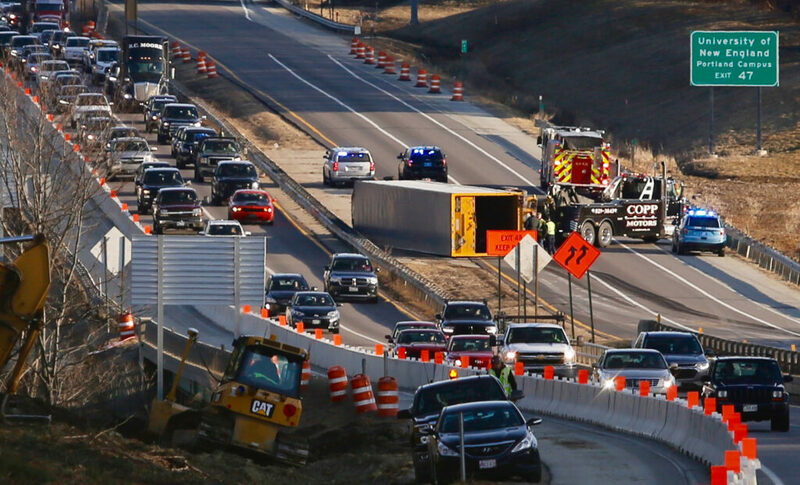 The accident occurred in a construction zone with signs warning of shifting lanes and an upcoming exit and concrete barriers to prevent vehicles from entering the shoulder. Police said it appears the truck hit the Jersey barriers on the right side of the highway and rolled onto its side. The truck blocked all northbound lanes. The truck was driven by Richard Keith Lamont Parncutt, 57, of Brunswick, Ohio, state police said. He drives for Estes Express Lines out of North Carolina and was hauling a partial load of cleaning solvent. Parncutt was taken to Maine Medical Center with minor injuries, police said. All northbound lanes had to be closed while the truck was unloaded and removed. Jersey barriers in the area also needed to be replaced. The crash created gridlock throughout Greater Portland during the morning commute. On the turnpike, northbound travelers experienced delays as far south as Saco. There were also significant delays on I-295 in Portland and on Route 1 in Scarborough and South Portland. Southbound turnpike traffic was not affected, police said.